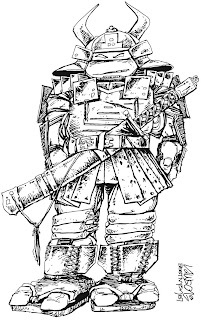 Peter Laird's TMNT blog: Blast from the Past #184: Lawson/Eastman "Samurai Turtle"
Leo would have made a great Samurai. Are both of the Lawson pictures precursors to the 92 portfolio, where Dooney does Leo as a samurai with Renet flung over his shoulder? Did Dooney get the idea from Lawson I guess is what I'm asking. Cynthia, dusting off her pics in anticipation of Comic-Con. Wish Jim wasn't so put out by his old work; I think it's great. I like his past work allot also. This reminds me a bit of the old Sewer Samurai Leo figure. -->> Same thing in my mind , Vaughn. Looks like old toy !! Instantly thought. Any pics of the turtles in ninja (shinobi shōzoku) garb? Like a shogun. Very nice.